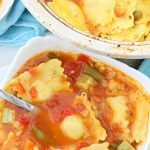 Frozen cheese ravioli are super easy and quick to cook and a delicious way to turn a simple vegetable soup into a ravioli soup that is a satisfying and filling main meal! This light vegetable soup can be cooked with either chicken or vegetable broth. Looking for an easy but yummy way to add more vegetables to your diet? 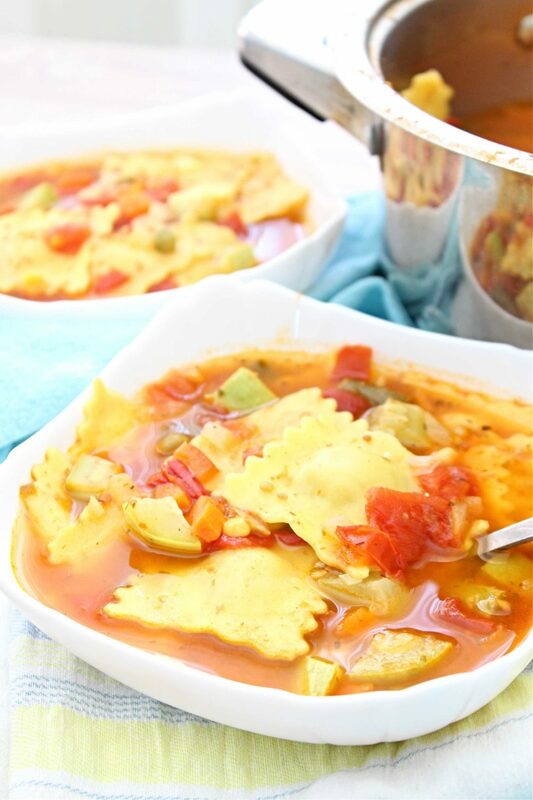 This ravioli soup is the perfect recipe! So easy and quick but full of wonderful flavors, this simple ravioli soup recipe is very suitable for busy families! I picked cheese ravioli for my ravioli soup but these can be replaced with meat ravioli or even tortellini. As an additional healthy boost, look for whole-wheat ravioli in the refrigerated or frozen section of your supermarket, when shopping for ingredients to make your ravioli soup. 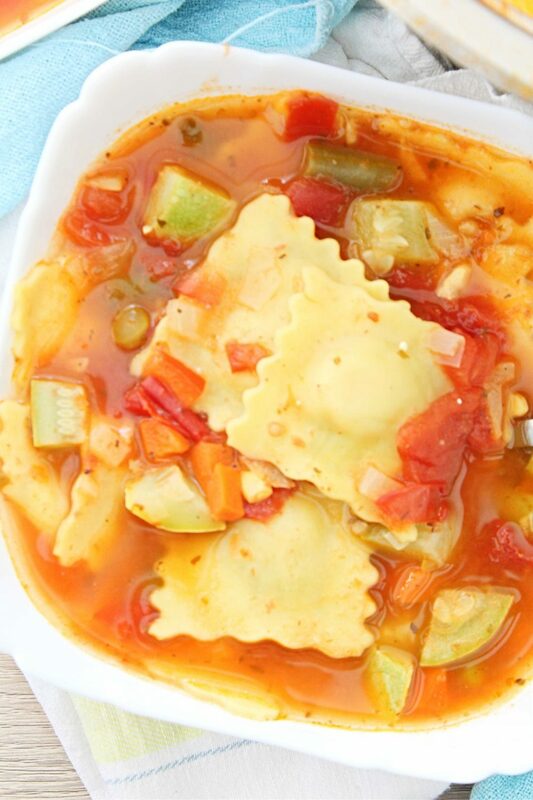 My tomato ravioli soup is full of healthy and delicious vegetables and comes together in about 25 minutes from start to finish. Great option if you’re trying to lose weight but are too busy to stick to a healthy diet that requires a lot of prepping of your healthy meals. Add pepper, onions and frozen vegetables and roast until a little soft, about 3 minutes. Add garlic and ground pepper and roast, stirring, for 1 minute. Transfer to a soup pot. Place soup pot over high heat and add diced tomatoes, broth of choice, water and marjoram; bring to a boil. Add ravioli and cook for 3 minutes less than the package directions. Time to add zucchini and cook about 3 minutes. 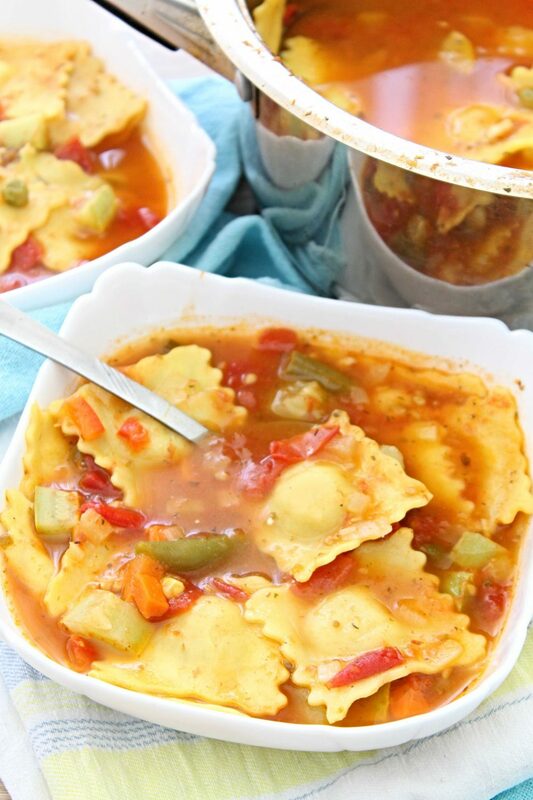 This cheese ravioli soup is hearty, rich, low in calories and fat and full of all your favorite fresh veggies! It will fill you up in no time but it’s easy on your calorie intake if you happen to “overindulge”! I made my ravioli soup with chicken broth but if you prefer going fully vegetarian use vegetable stock instead. Feel free to use your favorite vegetables instead of the ones I picked since these are my most favorite and I use them in most of my recipes. You can also make this soup a complete meal by simply adding grilled chicken. One thing is for sure! This simple but hearty soup will warm you up during the chillier months! Ravioli are a type of pasta dumplings consisting of two layers of pasta sandwiched together and filled with a variety of fillings such as ricotta cheese, spinach, mushrooms or meat. Ravioli are typically square shaped but they may also come in round or semi circular shapes. 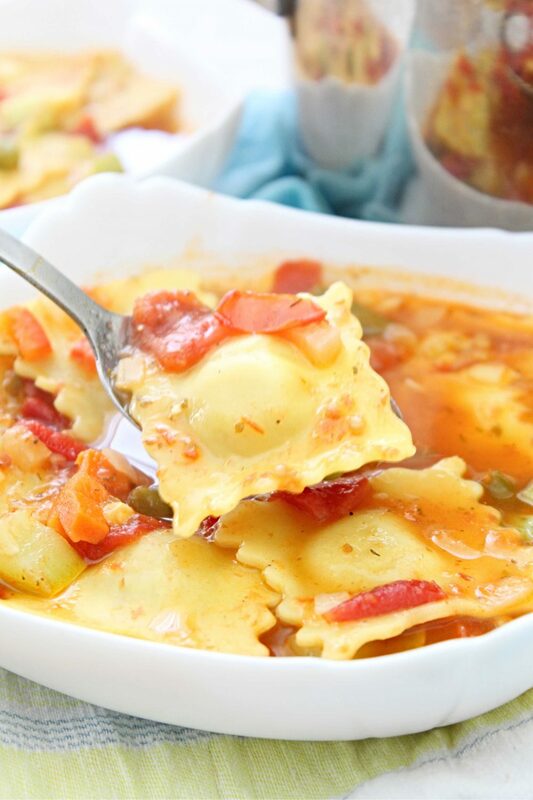 Ravioli pasta are traditionally used in Italian recipes with pasta sauce but can be used in soup recipes too, like this vegetable ravioli soup. As mentioned above, ravioli are not a soup per se, but a type of Italian pasta that can be used in soups with vegetables and chicken or vegetable broth or in pasta dishes with vegetable or meat pasta sauce. 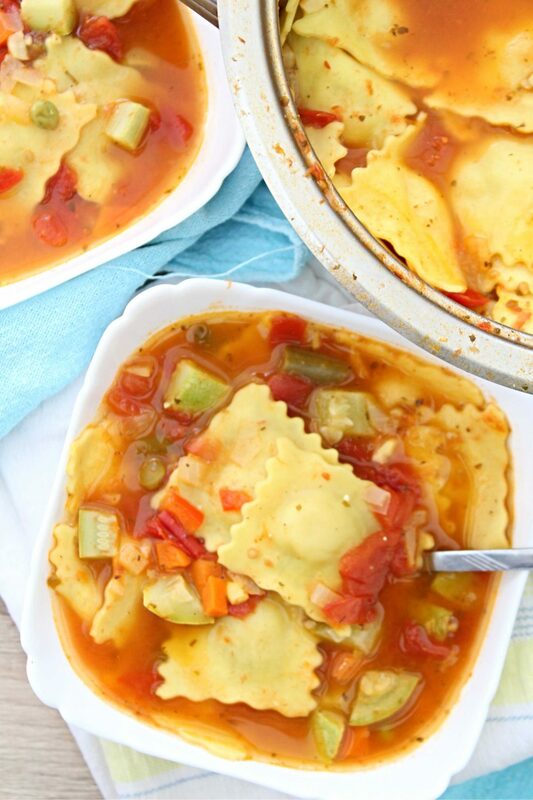 How do you make vegetable ravioli soup? I’ll be going into more thorough details regarding the ravioli soup recipe below but in a gist, you need to slightly roast the vegetables in a skillet, add the tomatoes, broth of choice and herbs and bring to boil then dump the ravioli and cook for a few more minutes. As with all pasta soups you may find that ravioli pasta might rise a little more after cooking and keeping the soup refrigerated. So you might wanna keep some more chicken or vegetable broth on hand to add as needed when serving your soup. How do you make creamy ravioli soup? After cooking your ravioli soup using the recipe provided below, you can opt for making this light a little bit more rich by adding sour cream or yogurt. You can also make a creamy sauce and add to the soup while cooking. To make your creamy sauce, mix a tablespoon of flour with 3-4 tablespoons mil and mix well until smooth. In a skillet, heat two tablespoons unsalted butter. Remove from heat and add the milk and flour sauce mixing to combine well. Return to heat and cook for 1 minute. Add the resulting sauce to the ravioli soup, just before adding the ravioli. Vegetable soups are healthy, hearty full of nutritious ingredients and fiber, keeping you full for longer periods. These soups are a great source of vitamins and minerals and are very low in calories and fat, making them the perfect dish to use in healthy diets or for when you need to lose weight. How do I make vegetable soup with ravioli? Make a simple vegetable soup using your favorite vegetables and simply add ravioli towards the end of the cooking process. 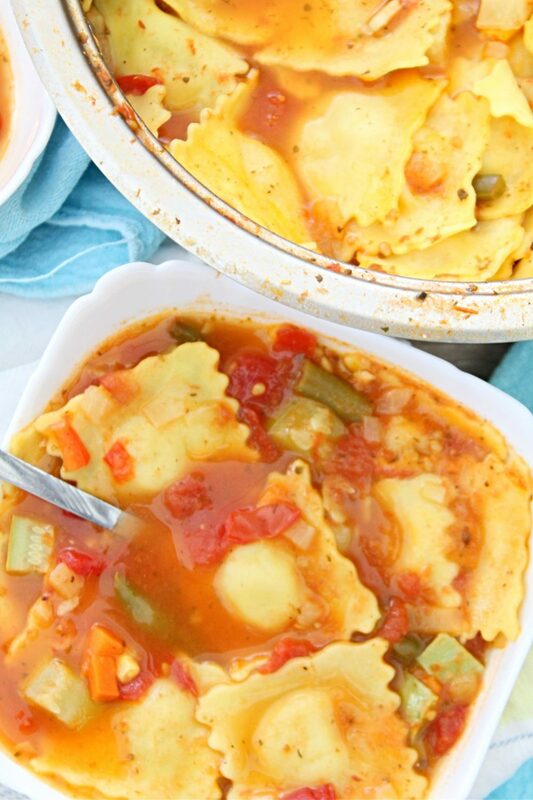 Frozen or refrigerated ravioli typically needs about 6 minutes to cook and make any vegetable soup a lot more filling and satiating, helping you feel full for longer. What are the best vegetables to put in soup? Virtually any vegetable would be a great addition to soups but the most popular are onions, potatoes, carrots, zucchini, mushrooms, bell peppers, frozen peas, celery root parsnip and corn. If you prefer your soup on the sweeter side you will want to use predominantly onions, carrots and red bell peppers in your soups. Adding mashed or minced garlic and fresh herbs like parsley, basil, thyme or bay leaves will make your soups a lot more flavorful and delicious! Can you replace ravioli in soups? Yes, you certainly can! Tortellini can be used instead of ravioli as well. Tortellini also come with a variety of fillings same as ravioli so choose the one that suits your taste and lifestyle choices best. What goes well with ravioli soup?